OK, I’ll admit it, I’ve been having a tough time finding great restaurants over these weeks I’ve been spending in Silicon Valley. I’ve found a few gems that I’ll be sharing with you all soon, but it ain’t easy. However, there are a couple densely populated ‘downtowns’ that help when hunting and downtown Palo Alto is one such example. Stanford University is located in Palo Alto, so there’s an actual restaurant row like you often find in college towns. 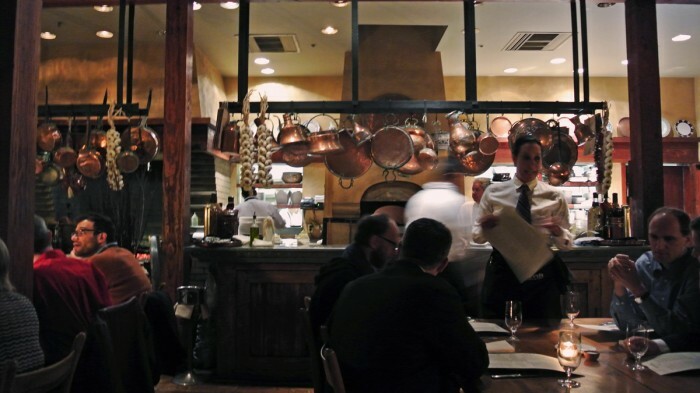 After asking a local Palo Alto-based friend for dinner advise and receiving a glowing recommendation, we ended up at an upscale Greek restaurant called Evvia Estiatorio. 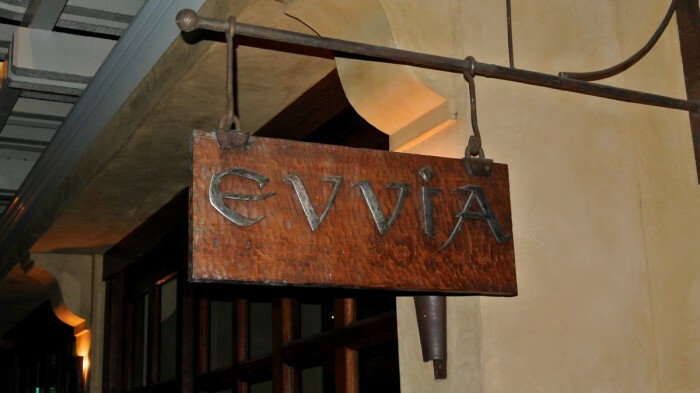 It’s hard to pass on a claim that Evvia is the best restaurant in Palo Alto so our group of six headed there on a Monday evening to check it out for ourselves. The restaurant was very spacious with a dark wooded, copper accented, low lit bistro vibe. It’s definitely got the right vibe for a date night if you need a spot in Palo Alto or any of the neighboring Silicon Valley towns. After getting seated, my group put the appetizer selection responsibility into my hands so I chose a few dishes for the group that I figured would be good choices at a Greek spot like this. First I picked the Saghanaki, a dish I love to order at Greek restaurants. 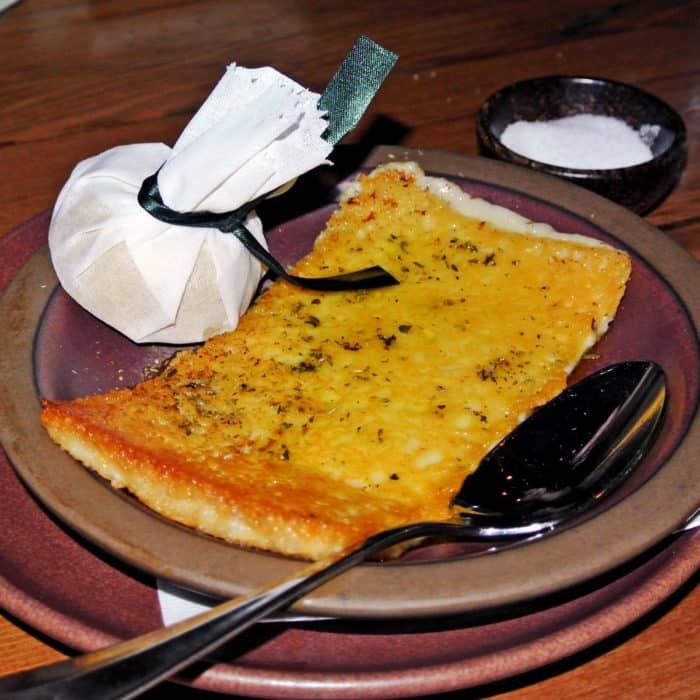 This is a traditional dish is made of springy kefilotieri cheese that’s doused in ouzo then lit on fire to crisp and cook the unmeltable block of cheese in its skillet. Dressed simply with lemon and olive oil it was ridiculously oozy, crispy, and delicious. It was absolutely bursting with an oily, buttery, juiciness and had mild citrus flavor. My dining companions were equally as impressed with the dish as I was. As a second table appetizer, I selected the Octapodaki tou Yiorgou. 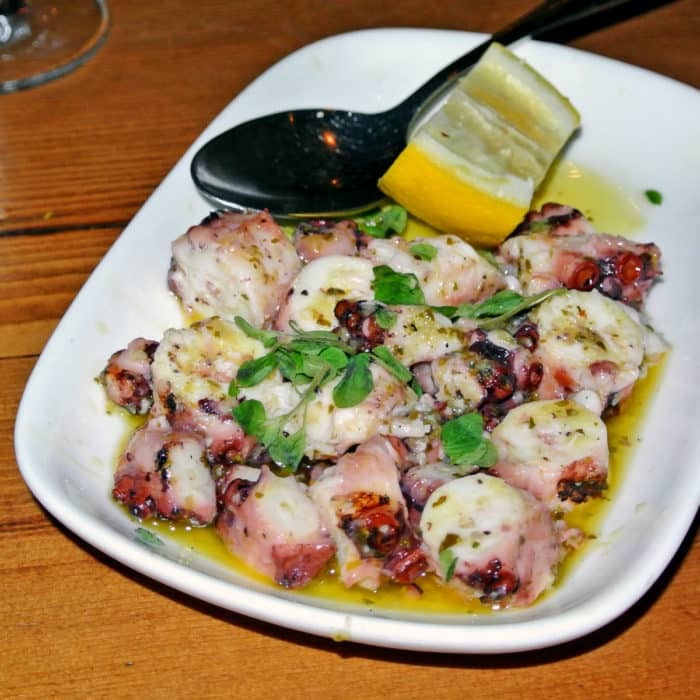 Now, personally I love octopus, but I understand how some people may be hesitant to eat something that looks the way octopus does. Well, this rendition was one of the best that I’ve ever had. The large hunks of octopus tentacle were unbelievably tender and had none of that chewiness you sometimes find with improperly cooked octopus. It was boldly garlicky with a bright citrus flavor that shined through in eat incredible bite. Truly addicting if you ask me. From there, we moved into main courses and I selected a dish called Kokinisto me Manestra. What I received was an enormous, gamey, meaty, tender, moist lamb shank served over a bed of orzo is in a liquidy, tomato-based broth. The portion was truly massive and the meat was tender and shredded easily with each pass of my fork. 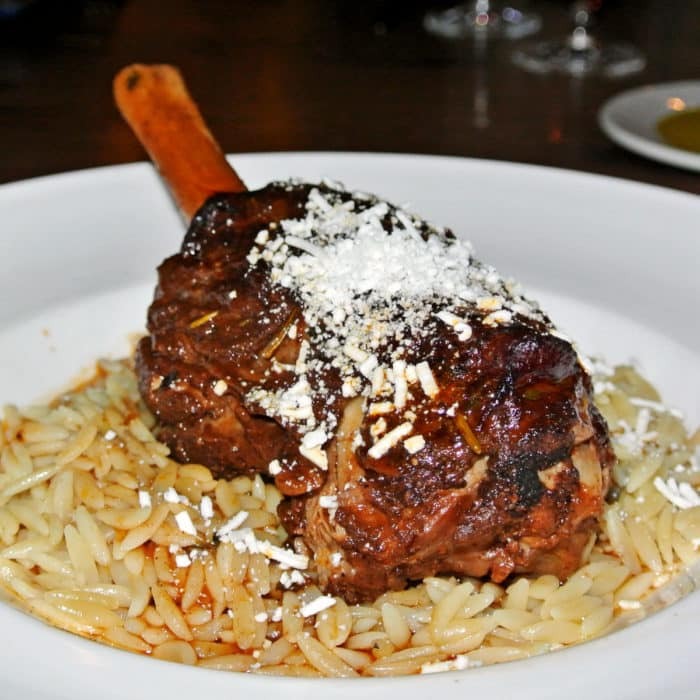 The meat had a lot of cinnamon flavor with paired nicely with tomato orzo and salty feta. If you’re looking for one more really sharable dish to round out your meal, I recommend the Marithes Tiganites. 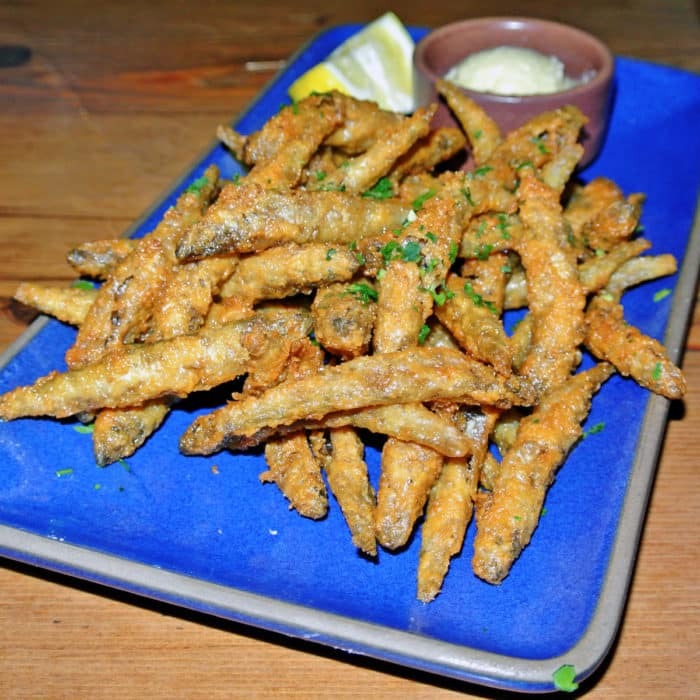 This dish is made of smelt which are a little fish not too dissimilar to anchovies and at Evvia they come breaded and deep fried with a great creamy aioli dipping sauce. The portion was enormous and the frying was done perfectly. This is the kind of salty, fried finger food that goes so well with a drink. In conclusion, I’ve found a winner in Palo Alto. All of the dishes I had were impeccably cooked and had outstanding flavors, but I’m always looking for my next great meal. So, if you’ve got experience dining in the Silicon Valley area, hook a brother up with some recommendations in the comments below.